This thread is about a controversial scientific discovery made about 15 years ago, recently repackaged into a scholarly paper format. Some of you may wonder why it is posted here, instead of posting it on boards specialized in physics, electrical engineering, or science in general. Well, it has been posted at such boards as well, but due to the active (and passive) suppression of controversial subjects in academia it was either ignored, or they have attempted to debunk it with ridiculous, false arguments and sneaky shill methods. No serious discussion or support was gained at those forums so far. Therefore – I thought – why not post it here as well? It can’t hurt, and it might reach the attention of people via this route, who can do something positive about it. Why would this subject deserve your attention and support, especially if you are not an expert of electrostatics? Because it has got the potential to open the door to “forbidden sciences” that are routinely ridiculed and rejected by the mainstream scientist, based on invalid postulates, and wrong physical models. It could open the door for free energy (FE) research in the mainstream science that could lead to rapid development of practical FE technology (they are getting the financial support). It could serve as a catalyst, or stepping stone for inventions that would solve your future energy problems very economically. This subject is not only important from economical point of view, but also due to the ecological impact of FE technology, and due to its potential to free the population form the slavery to fuels and energy providers. I will explain the subject in the following posts first in layman’s terms, and if there will be any expert participation in the discussion then we can talk about its scientific aspects as well, and get down into the nitty-gritty. 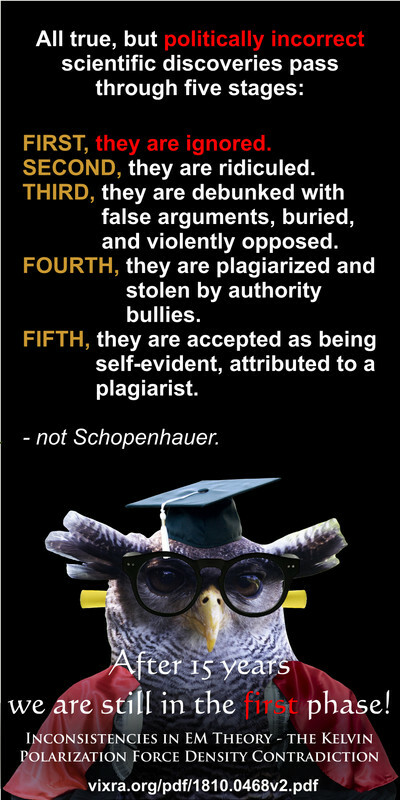 Let me close this introductory post with an appropriate meme that is a modern, extended version of Schopenhauer’s quote adapted to the science and academy. About 15 years ago as part of a research project, the electrostatic forces on a special cylindrical capacitor were calculated using the standard formulas and officially accepted scientific methods. The calculation result was totally unexpected and shocking, because it predicted the presence of a reactionless force on the capacitor, which violates Newton’s 3rd law. The natural first reaction was to look for an error in the analysis, because it seemed utterly preposterous even to think that the official science of electrostatics would contradict the most fundamental law of physics, the law of action and reaction. However, no error was found even after countless verification. Therefore, a prototype of the analyzed capacitor was constructed, and the resultant thrust on it was measured with very sensitive instruments. No reactionless thrust could be detected, which confirmed the validity of Newton’s 3rd law, but at the same time it has revealed a hidden inconsistency in the official science of electrostatics, and generally in physics. If the electromagnetic theory (that includes electrostatics) would be consistent, then the correct applications of its equations and analysis methodology supposed to satisfy the conservation laws, and also the law of action-reaction. In this specific case the application of the official science has lead to wrong results and to a paradox. In order to understand all the calculations and conclusions of the paper it is sufficient to read only the first 22 pages, the rest (Appendix) is only the description of some measuring equipment used in the project. However, the crucial calculations in which the error supposed to be found is on the first 6 pages. Thus, it is enough to read only the first 6 pages to realize that there is indeed a contradiction, and look for a solution to this problem. Even if this particular subject doesn’t belong to your field of interest, please help spreading the word, and forward the links (or this message) to others who might be interested in it. The discovery of this paradox shakes the very foundations of physics and it will have far reaching consequences that are not apparent to the public, which will be the subject of my following papers. It is important to know that the paper does not contain any new theory or calculation method that could be labeled as ‘crackpot science’. Everything in the paper is based on well established, officially accepted scientific laws, equations, and calculation methods. The only thing controversial about it is that the correct application of these formulas and calculation methods lead to extremely wrong results, and creates a paradox. The results basically say (in laymen’s terms) that charged special cylindrical (or spherical) capacitors could be used as the ‘antigravity drives’ or thrusters of flying saucers, like those from the sci-fi movies. It is analogous to a caricature where a person pulls himself out of a mire by his own hair. Although it would be brilliant if these simple capacitors could generate reactionless thrust, unfortunately the measurements have proven that they don’t create such resultant force. The calculation results are not just slightly wrong due to approximations and/or rounding errors, but they are fundamentally wrong, because they contradict the conservation laws of physics, and also the law of action-reaction. If a new theory of an FE researcher would lead to such wrong results, then it would be hammered and ridiculed into oblivion from all academic propaganda channels (like Randi) to discredit alternative science as crackpottery. But now, when the official EM theory leads to such an ‘unthinkable’ paradox, then that is simply buried with silence, and ignored as if this paradox would not exist at all. Such oppressive policy is the direct consequence of money- and power interests that rest on the system of authority and blind belief. In the times of Galielo the authority who was assumed to know the absolute truth was the Pope and the Church. The peasants and other subjects paid their taxes and obeyed their masters because they were intimidated into obedience by the ‘carrot and sticks method’ of the religion. If they obeyed, they were promised eternal life in heaven; if they rebelled, they were to burn in hell for an eternity. You can’t get much more intimidating than that, if only your subjects believe this narrative. Most people think that such oppressive system could exist only in the distant past, when people were still ignorant; but not today, because we in the 21st century are free and enlightened… Unfortunately, that is not true. The basic structure of control and power still rests on that system of blind belief in authority. The authority of the church has been replaced by the authority of the official science and by its representative body of academy. Today people still pay their taxes because they believe in the authority of the government; they also blindly believe the claims of scientific authorities (thinking they must know things better; they must be honest). Instead of scaring them into obedience with hell, today people are bullied into obedience by the boogieman of global warming, hoax epidemics, nuclear wars, etc. It is still imperative even today to maintain an unshakable trust in authority; otherwise people might start thinking on their own, and do the unthinkable: disobey, or worse, rebel. Exposing the inconsistency of official science, and pointing out embedded paradoxes threaten this illusion of unquestionable authority. This is one of the main motivations of the establishment for ignoring and/or debunking the paper with false arguments. Another motivation is based on financial interests of energy industry, as mentioned in the first post. The results basically say (in laymen’s terms) that charged special cylindrical (or spherical) capacitors could be used as the ‘antigravity drives’ or thrusters of flying saucers, like those from the sci-fi movies. It is analogous to a caricature where a person pulls himself out of a mire by his own hair. Although it would be brilliant if these simple capacitors could generate reactionless thrust, unfortunately the measurements have proven that they don’t create such resultant force. What kinds of methodology, if any might work? The calculation results are not just slightly wrong due to approximations and/or rounding errors, but they are fundamentally wrong, because they contradict the conservation laws of physics, and also the law of action-reaction. First of all the readers have to understand that the subject and purpose of the paper is not the design and making of thrusters (or ‘antigravity drives’). The aim is to scientifically prove that there is a paradox in the official theory of electrostatics (and physics), which is also a proof that it is inconsistent. A paradox may not exist in a science worth the name ‘science’, because if it does contain paradoxes then it can’t be taken seriously (and applied without reservations); it can’t be considered as an authoritative body of knowledge. Despite its paradoxes and general invalidity it may be still useful for solving some practical problems for which it gives correct results, as long as we keep in mind its limitations. But, it can’t be the ultimate source of authority that decides what is true and what is false in all possible cases and situations, like the priesthood of academy wants you to believe. You may think “nahh… that is just a funny parody of an absurd situation that could not possibly exist in today’s science, right…? Otherwise scientists would have recognized these paradoxes long ago and rebelled against a system that deliberately wants to keep these paradoxes”. Wake up people, some scientists did rebel already, and the rebellion is still alive even after 100 years of “scientific guerrilla warfare”, just you the people are not informed about it. Unfortunately, our reality is stranger than fiction, and the official science is full with deliberate obfuscations, deceptions, fraud, and paradoxes. Only money and power decides what the official science should be, what should be taught in schools and universities, and what must be excluded; what must be enforced as truth, and what must be rejected and ridiculed as false, or impossibility. The contradiction revealed in my paper is not the only paradox that plagues the science of physics; another example is the Catt’s anomaly. Yet another controversy in physics is about Einstein’s theories of relativity that is still criticized and continuously debunked by highly qualified physicists with valid arguments even after 100 years. The concept of aether has been exorcised from the official physics for a very nefarious reason, not because it really does not exist. There have been societies of dissident scientists established specifically for the purpose of exposing the truth about this deliberately perpetuated scientific hoax. There are also science forums where the main theme is the continuous and relentless debunking of Einstein’s relativity theories. Yet, the official science still maintains and enforces them with iron fists, under the threat of destroying the careers of all dissenters. We could talk about the financial motivation behind this policy, but let’s not get into the discussion of all existing hoaxes and inconsistencies, because then we would have to write a book on this forum. The problem with officially recognizing the contradiction revealed in my paper is that if physics still contains paradoxes, then the inquisitors of official science loose the moral and authoritative high ground as the ultimate human arbitrators of truth. The reality sets in that their claims and opinions that were thought to be absolutely correct, true, and reliably authoritative can be wrong. If they can be wrong, and the scientific theories they have cherished thus far as settled and consistent is proven to contain paradoxes, then the door opens for revision of the system. If such a revision is possible and necessary, then science as a whole can be improved, and new discoveries, inventions thought thus far to be impossible will become a possibility. Which and/or whose specific calculation results? OK, so we didn’t get into the discussion of the technical/scientific aspect of the paper in this thread yet, which is the calculation of the resultant force on a charged special cylindrical capacitor. I can write a simplified explanation about this in another post later. The calculation is presented in the paper; more specifically the most important part is on the first 6 pages. The original calculation is mine, but anybody familiar with electrostatics can perform the same, and should arrive to the same results, because the official science and its methodology inevitably lead to the presented result. For example the calculation of the length of the hypotenuse of a right triangle as c=sqrt(a^2+b^2) was first performed by Pythagoras, but the same calculation can be performed by anyone, and the science of mathematics will inevitably lead to the same result (as long as one follows the rules of mathematics correctly). Similarly, if anyone follows the ‘rules’ and laws of today’s official electrostatics and physics, he will inevitable obtain the same (wrong) results that I have presented in my paper (the results contradict reality). The wrong result is not due to mistakes in the calculation; it not the fault of the person performing the calculations, but it is caused by some wrong and inconsistent laws and rules of today's physics (analogous to the inconsistent mathematical rules that lead to two value results of addition, as practiced on planet Awkward in the above story). Before getting into a simplified explanation of the calculations, it might be worthwhile to address some possible issues that non-experts might have when reading this thread. One of these issues is the subconscious (or conscious) hate of mathematics that looks complicated to them. This is a serious turnoff especially for people whose professions don’t require the use of higher mathematics (therefore they have never learned it), like politicians, lawyers, physicians, historians, news reporters, painters, carpenters, etc. They cover the entire high-school math curriculum in one year and get Master's degrees by the time they are seventeen (Some as young as 14!!). I have never visited that school personally and can’t guarantee that their unbelievable claims are really true or contain a bit of exaggeration, but even if half of it is true, that is still remarkable. The two main features of their teaching methodology are that the students learn only one subject at a time. For example if they start learning math, then that is the only subject they will study all day long as long as they don’t pass the final exams. The dry mental effort of the abstract math is diluted with the fun physical activity of dance that refreshes the mind and body. The other unusual feature of their school is that the students learn most of the subject from one another from books; students who understood something, teach those who don’t quite get it yet. This way both parties learn; the understanding of those who tutor others deepens and gets tested at the same time during the explanations. Professional teachers also teach there, but not all the time like in the conventional systems of education. But today just about anybody can learn all the math used in my paper for free in their free time from freely available online courses offered by individuals on youtube or on their websites, or by independent educational organizations (like Khan Academy https://www.khanacademy.org), and also by accredited universities (like MIT https://ocw.mit.edu/courses/find-by-topic/#cat=mathematics&subcat=calculus). Please don’t misunderstand this point, I am not expecting from you to study calculus just in order to understand the paper, but only offering tips to those who get interested in this thing enough that they want to understand all the details of the math involved. I hope that this little intro helped to warm the readers up a bit to math. But why do we need higher mathematics in the first place? In order to make our lives easier, we have to manipulate matter and build machines and buildings. In order to design and build working machines, we have to understand how nature behaves, both qualitatively and also quantitatively. If a child knows that objects fall downwards from high places (and not upwards to the sky), then that is a useful qualitative knowledge that can save his life by not standing under unstable heavy objects. But if a rocket scientist wants to design a rocket, then he will have to be able to predict the exact motion of the rocket under the force of gravity. The prediction of the exact behavior of objects is done with the help of calculations, using the equations of physics, which is the quantitative knowledge that requires the use of higher mathematics. The purpose of calculus is to simplify the behavior of complicated physical systems to the point where we are able to numerically predict what is going to happen to the observed and/or manipulated objects. Finally, let me emphasize that even though my paper proves that there is a paradox in the science of today’s electrostatics, and I have already criticized the authoritative system of official academy, I still respect the science we have today and the people who use it and teach it. But this respect and appreciation does not mean that we have to ignore obvious contradictions, and sweep them under the rug. Quite the opposite, exactly out of this respect we have to strive to find, acknowledge, and eliminate such paradoxes and inconsistencies from our science, and make it model reality more accurately. If the plutocrats attempt to hide paradoxes and/or assert their validity in science by force out of financial interests, then our duty is to resist this war on truth and fight for a correct, consistent, and valid science. The phrase “knowledge is power” can be misleading. Correct knowledge and the knowledge of the full truth is the real power. This is what the rulers of the world strive for and have. Wrong knowledge is weakness, and the source of defeat. The knowledge of partial truth and partially correct knowledge is limited power, and partial weakness. This is what we have today, partial truth. What is left out, and what is deliberately hidden is the real big power that the plutocracy wants to keep for themselves, and by all means possible wants to keep away from the commoners. That is the reason for all the infightings within the academy and all those paradoxes swept under the rug. The objective of the paper is to prove that today’s theory and mathematical model of electrostatics is contradictory, it contains a paradox; with other words it is inconsistent with some other laws of physics. Let me illustrate the difference between consistent and inconsistent theories and mathematical models (although it is kind of obvious). Physical theories have to be self-consistent and consistent with observation as well. Besides that, a complete scientific theory of physics supposed to be valid everywhere in the universe and also at any time. The law of gravity and the gravitational field is conservative, which means that it always satisfies the law of energy conservation. The gravitational field can only store energy, and it can do work only by exhausting the stored potential energy, but it can not do continuous cyclic work on its own, and it can’t generate excess energy. The law of gravity is consistent with the law of energy conservation because the force field everywhere on Earth points towards the center of the planet. Now imagine another planet elsewhere in the universe where the force of gravity does not points towards the center of the planet, but it has got a tangential component as well. Let’s say that this tangential component points towards the east, and if you were standing on the surface of the planet you would feel your weight pulling you downwards like on earth, but you would also feel an additional force that would push you towards the east, as if a subtle wind would be pushing you. On such a planet our theory of physics would be inconsistent, because such field of gravity would not be conservative. It could be the source of inexhaustible free energy. All you would have to do is build a closed railway around the planet in E-W direction, and let wagons run towards the east while generating electrical energy using attached magnets and/or induction coils. The laws of that gravity would contradict the law of energy conservation, which would form a paradox, and our science of physics would be inconsistent on that planet. Let’s talk now about what do we mean by ‘reactionless force’ in the paper, and how we interpret Newton’s 3rd law in this context. Active forces in nature always come in pairs; or with other words an active force pointing in one direction is always accompanied with an active force of same magnitude but oriented in the opposite direction. When a stretched straight rubber band is pulling two objects towards one another, then the active force of the rubber on one end is the same as the active force on the other end, just in the opposite direction. The active pressure force that accelerates the rocket is the same as the active pressure force that accelerates the exhaust gas in the opposite direction etc. In contrast to an active force, a passive force is the manifestation of inertia or reaction, and it appears only as a mirror image of an active force that is resisting acceleration, or opposes the active force. Under reactionless force we mean an active force that does not come as a pair of equal active forces oriented in opposite directions. It is a single active force that is able to accelerate a mass without the need to push against another mass in the opposite direction. According to today’s physics such a reactionless force can not exist, because it would violate the law of momentum conservation, and also the law of energy conservation. The claim that a reactionless force violates Newton’s 3rd law (the law of action and reaction) in this context means that an active force would come without its active pair in the opposite direction, and violate the law of momentum conservation. If we calculate the resultant electrostatic force on the closed charged special capacitor described in the paper according to the official science of electrostatics, then the result will predict such a reactionless force. This result contradicts the law of momentum conservation, and also the law of energy conservation, thus it renders the science of electrostatics inconsistent with these laws of physics.